The Public Lighting Authority of Detroit is working hard to restore light to the hundreds of blocks in Detroit where street lighting had gone dark, and needed a new website to convey that message and mission. 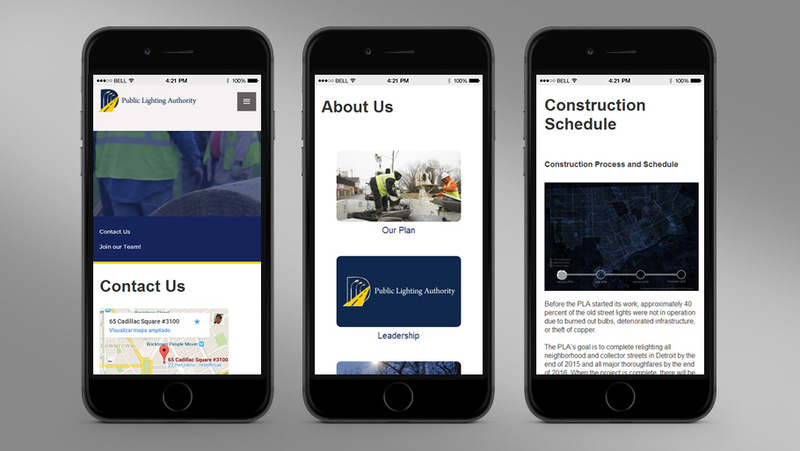 Media Genesis worked with the PLA to design a new site that was easy for residents to use to see what lights were being restored, report outages, read about the plans and stay interactive with the organization. Additionally, Media Genesis designed and built the site to be responsive on mobile devices, and the site has a WordPress Content Management System so the PLA can update the site as fast as the work they are doing! Finally, Media Genesis took the photography and videography used in the site, shadowing light installation crews for several days to get shots of them in action. Detroit’s future is brighter, and Media Genesis is there to help.